The Nuriootpa Viticulture Experiment Station was established in 1937 as the major centre serving South Australia’s wine grape industry. At the time, the Barossa Valley was the centre of the wine grape industry with other major production districts being in the outer suburbs of Adelaide, Clare Valley, Riverland and South East. In 1937, the Barossa Valley also had a significant stone fruit industry with a major apricot drying industry and fruit canning enterprise (Barossa Canneries Ltd). Nuriootpa Viticulture Experiment Station was modelled on the Kybybolite Experimental Farm (orchard), Blackwood Experimental Orchard and Berri Experimental Orchard, which were established in 1905, 1908 and 1911 respectively. These were designed to provide research and technical development services to horticulture industries in the South East, Adelaide Hills, and Riverland districts. During the early years, a series of names were used to describe the Nuriootpa Viticultural Experiment Station, including “Barossa Viticultural Station”, “Government Viticultural Station Nuriootpa”, and “State Viticultural Station, Nuriootpa”. In the late 1960’s new vine propagation and laboratory facilities were built followed by further upgrades to viticulture research facilities in the 1970’s. In 1982, a larger new office, laboratory, conference and library complex was opened. Expansion of office accommodation at the Nuriootpa Research and Advisory Centre enabled the team of staff serving the lower and mid north cereal, dairy, animal, and horticulture industries, and soils technical staff to be relocated from the Nuriootpa District Office (and previously the Kapunda District Office). Nuriootpa Viticulture Experiment Station was now serving all agricultural industries across the lower north of the state, and was renamed the Nuriootpa Research and Advisory Centre. Today (2014), the complex is known as Nuriootpa Research Centre and houses staff from PIRSA, SARDI (a Division of PIRSA), and Rural Solutions SA. Mr John Harris, Horticultural Instructor for the Northern Region was responsible for supervising the first 10 years of development, commencing in 1937. The first full time manager of the Nuriootpa Viticultural Experiment Station, Mr John Jennings, was appointed on 3rdMay 1947 (previously he was Assistant Manager, Berri Experimental Orchard). John Jennings later worked as the District Horticultural Adviser based in Waikerie for many years. Bryan Coombe was appointed as the first Viticultural Research Officer in March 1948. He subsequently studied a PhD at Davis, California in 1956-57, and played an important role in the development of the viticulture and oenology unit at the University of Adelaide. Other past Nuriootpa Research Centre managers have included Harry Tulloch (appointed September 1955) (awarded the Rudi Buring Memorial Scholarship and studied at University of California, Davis in 1961), Max Loder, Reg Radford, Andrew Staniford, Richard Hamilton, and Tony Gerlach. Mr Roger Maywald is the current (2014) Centre manager. In 1937, 50 acres of land was purchased for establishment of a viticulture experiment station. This land is immediately east of the Nuriootpa township on what is now known as Research Road. Preliminary planning work commenced in that year. In 1938-39, 20 acres of land was developed and 10 acres of Grenache, Shiraz, Sherry and Tokay vines were planted for sub soiling, planting distance and manurial trials. 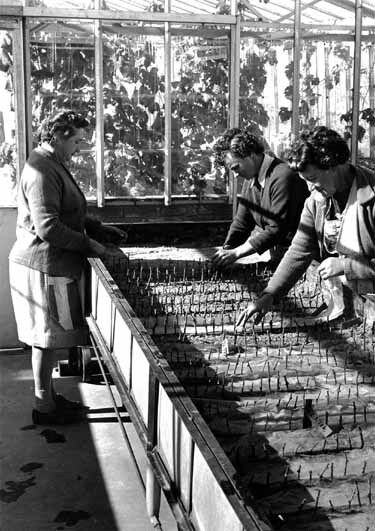 The initial 40,000 cuttings required for planting the Nuriootpa Viticulture Experiment Station were propagated at the Department of Agriculture’s Fullarton Orchard on Fullarton Road in 1937-38. By 1940, fences, stables and chaff shed had been erected, and horses and implements purchased. About 10 acres was dedicated to growing hay. 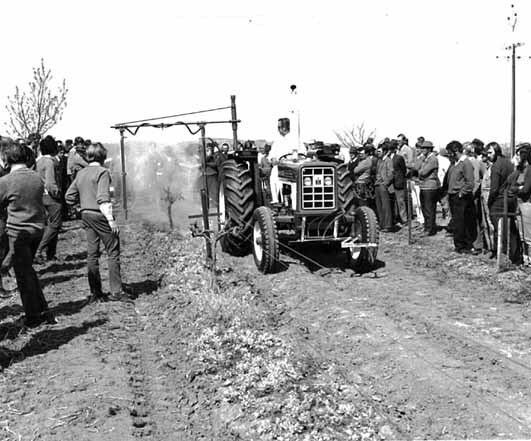 Through the early 1940’s, a further 2 acres were planted to Mataro, 6 ac were developed for a variety and training trial, and plantings were gradually expanded through until 1946. The first 7 ac of vines were trellised in 1942, while a meteorological station was established in 1941. Orchard heaters and fuel oil were purchased for experiments in frost control, and proved very successful during a period of severe frosts in 1944. 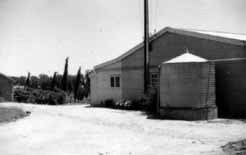 Meteorological station, Nuriootpa Viticulture Experiment Station in 1959. This weather station was established in 1941. 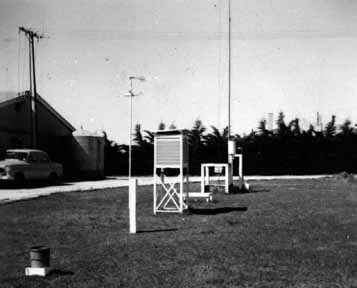 An automated weather station was subsequently installed and continues to provide data to the Bureau of Meteorology after 73 years. In 1945-46, a further 7 acres was prepared for planting, and the first meaningful crop data began to be produced. The centre’s first field day was held in 1947. On 29 July 1948, the Minister for Agriculture (Sir George Jenkins) opened a major pruning and demonstration field day that attracted about 70 growers. Early results from sub soiling, zinc deficiency, frost control, cover cropping and trellising experiments were presented at this first field day. In the late 1940’s a bore was drilled and pump installed. The centre’s first tractor and implements were purchased in 1949, a Ferguson tractor with 3 furrow mouldboard plough and 9 tyne cultivator. A Harvey tool bar and disk cultivator, and a truck were also purchased in 1949. Over the years, 2 houses (the initial Manager’s house was built in 1950) and prefabricated pickers quarters (1959) were built on the property to accommodate the centre manager, research officer and pickers. These houses are no longer in use and have been removed. By the mid 1950’s, Nuriootpa’s plantings were providing significant data and information for the SA wine industry. Planning for a small cream brick office, laboratory and library building to better house the growing number of staff was commenced in 1963. This new building was opened in May 1965 by the Minister for Agriculture The Hon G. Bywaters. In the late 1960’s a new potting shed complex (including glasshouses, shadehouse, potting mix blending facility and propagation benches), machinery shed and workshop were built. This was opened in 1969 to support the expanding vine improvement program. Another 30 ac (12 ha) block of land was purchased from the Maywald family (on the east side of Research Road) in the mid 1970’s. The land purchase negotiations were led by Chief Horticulturalist Mr Tom Miller. This land was subsequently developed with a bore, irrigation mains, fencing and new trellising. Construction of the current office, laboratory, conference and library complex commenced in 1980 and it was formally opened in May 1982. Over its 75 years of operation, the Nuriootpa Research Centre has played a key role in the development of the SA wine industry. Following is a summary of major research and advisory projects that have been focussed at Nuriootpa. 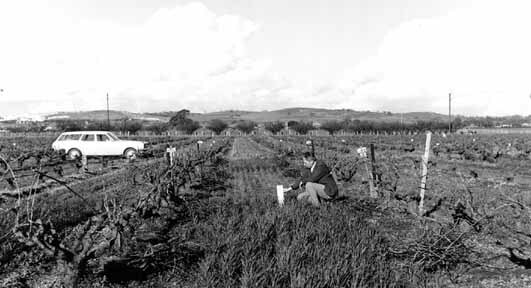 Collection of vine sports from across the State commenced in 1942, and a 0.5 ac variety plot was planted in 1943-44. By 1950, a large collection of vine varieties and clones had been planted at Nuriootpa. Today, Nuriootpa maintains a large collection of variety and rootstock material, and has one of two national wine grape germplasm collections (the other is held by CSIRO at Koorlong). The Centre also holds a unique collection of many clones of all the major wine grape varieties used in Australia. 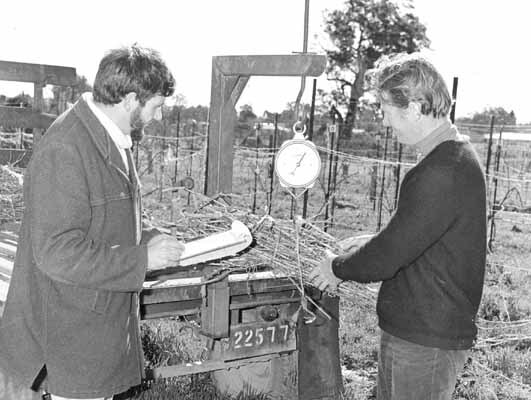 Measuring cutting yields to assess vine performance – Reg Radford and Tony Chapman - early 1970’s. 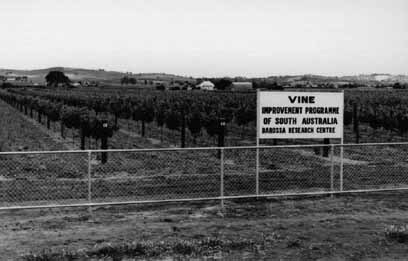 The SA Vine Improvement Program was commenced in 1957. Selections of high performing clones such as Shiraz selection 1654 (selected by Harry Tulloch) led to the planting of foundation vines at Nuriootpa. These foundation blocks were subsequently replicated in other grape growing regions of the state. Establishing more source blocks across SA using the best varietal clones for propagation. Fostering district vine selection and skilling growers to select the best planting material. Selection of the best performing clones from a yield and wine quality perspective. Evaluation of rootstocks in conjunction with the Phylloxera Board of SA. Following study in Germany and California, Mr Tony Chapman developed advanced vine grafting and mist propagation techniques during the early 1980’s. This included evaluation and introduction of bench grafting machinery to reduce labour requirements and speed vine propagation. Propagating two bud cuttings on a heated bed – 1970’s. In the early 2000’s, SARDI (a Division of PIRSA) selected (under the guidance of Dr Michael McCarthy) 8 of the best historical Shiraz clones with consistent colour and phenolic characteristics. The heritage of these clones was traced back to some of the oldest vineyards at McLaren Vale, Langhorne Creek and the Barossa Valley. These have recently been released as the SARDI Heritage Clones and are now being distributed nationally with strong interest from wine makers. 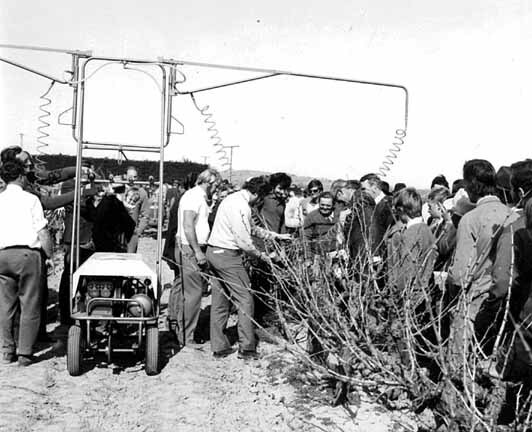 Up until 1969, most of the table wine grapes produced at the Nuriootpa Research Centre were used by the Roseworthy Agricultural College winery for small lot wine making and training of oenology students. After 1969, grapes produced on the centre were marketed through local wineries. With new clones, small lot batches of wine were made for quality evaluation, with some of this wine being used through the School of Food and Catering at Regency Park. Vine Improvement program plantings – east of Research Road, C1980. Cuttings from these vines were used to establish many major vineyards across SA. 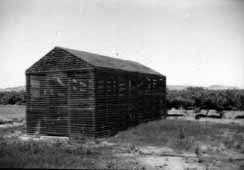 The original shade house used for vine cutting propagation at Nuriootpa – 1959. Initial experiments at Nuriootpa through the 1940’s were focussed on sub soil cultivation techniques and the influence of planting densities on yield. These soil experiments continued into the 1950’s and were later expanded to include use of green manure or cover crops (peas, beans, barley, rye etc) in conjunction with fertiliser experiments. This was part of a coordinated program between Blackwood Experimental Orchard, Berri Experimental Orchard and Nuriootpa to develop alternate orchard and vineyard soil management techniques. Manurial trial – impact of nutrients on cover crop growth – Max Loder early 1970’s. These early experiments identified the importance of zinc availability for vine performance, and the value of phosphorus and nitrogen applications. Deep ripping and placement of gypsum. Mulches – development of straw and other mulch materials commenced in the 1980’s and is now widely used by vignerons. Supporting the role of Landcare groups in improving soil management practices. Use of neutron soil moisture probes (Mr Max Till) to monitor ground water levels and address district drainage issues. Promotion of zero or non-till soil management systems. 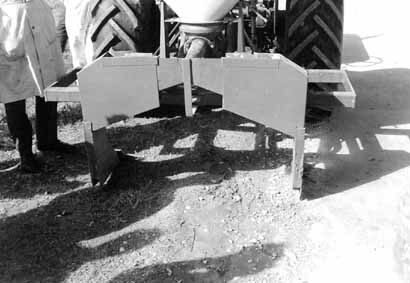 A special ripper developed for deep placement of gypsum in vineyard soils. Initially, Barossa Valley vignerons were totally dependent on natural rainfall, resulting in variable grape yields and quality. With growing economic pressures, grape growers were keen to use irrigation to increase yields. Underground aquifers were the main source of irrigation water. During the late 1960’s District Horticulture Adviser, David Hodge gathered valuable information on water quality of streams in the Barossa Valley. Through the 1970’s there was significant expansion of irrigation in the Barossa as growers adopted drip irrigation systems. Nuriootpa Viticulture Centre staff played a key role in evaluating performance and developing drip irrigation technology for wine grapes. During the late 1970’s to early 1980’s, Dr Michael McCarthy conducted a number of irrigation experiments to assess the influence of drip irrigation on vine yield and wine quality. Results from these experiments provided critical data for proclamation of the Barossa Valley aquifer under the Water Resources Act 1976. Partial Rootzone Drying was another irrigation project that delivered significant savings in water use. It was commenced in pot experiments at the Waite complex by Dr Brian Loveys, with some of the subsequent commercial field evaluation using duplicate irrigation control systems occurring at Nuriootpa. Vineyard soil surveys to assist irrigation system design and optimise water application rates. Skilling growers about irrigation system management, vine physiology and impacts of environmental conditions on vine water needs. This formal training and field day program was run over 2 years with more than 240 Barossa and Clare growers participating. Adoption of Regulated Deficit Irrigation technology to achieve optimum yields and improve grape quality. Use of tensiometers and evaporimeters to monitor soil moisture levels and schedule irrigation. Evaluation and promotion of new technologies for the continuous measurement of soil water in vineyards. Evaluation and development of trellising systems to increase yield and fruit quality. Hedging and canopy management to improve fruit quality. Vine spacing, including high density plantings up to 8,000 vines /ha. Identification of bud mite and the use of sulphur treatments to manage this pest. Identification of Eutypa or dying arm disease and introduction of management measures. Ampelography, the technique of identifying vine varieties using leaf characteristics, was introduced in 1964 by Mr Wally Boehm, and later progressed by Mr Jim Furkaliev. Ampelography was important in ensuring that all vines in Source Blocks (used for cutting supplies) were true to type. This technology also assisted wineries to ensure fruit for varietal wines was sourced from vineyards with correctly identified varieties. Running of the first Viticulture Technical Conference at Tanunda in 1972. This has developed into the triennial Australian Wine Industry Technical Conference. Establishment of a series of District Advisory Committees across the State’s major wine districts. Improved management of winery marc and waste water. Assessment and introduction of glyphosate in the mid 1970’s for effective control of perennial weeds like couch and Johnson grass. Importantly, glyphosate enabled the elimination of under row cultivation (“vine dodging”), resulting in improved soil organic matter levels and reduced vine root damage. Evaluation of native grass species for use in no till vineyard floors. Severe labour shortages after WW2 resulted in a search for a range of labour saving devices in horticulture. Compressed air operated pruning equipment was imported from California in 1951-52 for evaluation. However it was a further 20 years before pneumatic pruning was widely adopted by industry. The adoption of air blast sprayers introduced from Canada in 1948 for orchard spraying were ultimately adapted to vineyards, and proved a major labour saver for vignerons. Many field days held at Nuriootpa Research Centre featured the latest developments in fertilizer application techniques, cover crops, vineyard mowing and mulching machinery, spraying technology, pruning equipment and trellising systems. Apricot gummosis was a major disease of the important fresh and dried apricot industries across South Australia. A significant research program was facilitated by Waite Institute scientists led by Dr Bill Moller. A 5 acre field research facility was established at Nuriootpa High School in 1946-47 under management of staff at Nuriootpa Research Centre. Initially 1 ac of apricots were planted in 1947, with a further 1 ac being planted in 1949. By 1957, this area was the main apricot gummosis research site in Australia. The Nuriootpa High School apricot research site played a pivotal role in developing modified pruning and other control measures for apricot gummosis. In the early 1950’s, the Department of Agriculture extension officers serving the Lower North were in several locations. Agriculture Adviser Cec Gross was located at Balaklava while the Poultry Adviser, Errol Polden was located at Riverton and the Horticultural Adviser (John Gursansky) at Nuriootpa. In 1953, the Department of Agriculture established a shop front office at Kapunda. Staff at the Kapunda office included soils officers and advisory staff serving the grains, dairy and livestock industries. The Kapunda office was closed in 1960 and staff transferred to the Nuriootpa District Office. The Nuriootpa District Office was commissioned on 18th January 1960 and located at the Nuriootpa Institute. In a circular dated 15th January 1960, the Chief Horticulturalist announced that the initial staff to be located at the Nuriootpa District Office were Allan Clarke, Peter Marrett, Steve Moore, John Gursansky and a typist. For the next 20 years, advisory services to horticulture, dairy, livestock and grain industries across the Barossa and lower north districts were served by advisers based at Nuriootpa District Office. They operated in a region from Gawler to Clare and east to the Murray Plains. Dairy Advisers Wilf Bowen and Russel Bowden served dairy farmers in the area from Jamestown south to the Barossa Valley. Nuriootpa District Office staff were transferred to more spacious accommodation when a new office and laboratory complex at Nuriootpa Viticulture Station was completed in 1982. The opening of this new office complex was the culmination of a major redevelopment program for the Nuriootpa Centre that also included building of a new glasshouse, propagation facilities, workshop, implement shed and laboratory facilities. Mapping of soils across the various catchment areas. This work was documented in the bulletin “Soils and Agriculture of the Northern and Yorke Peninsula Regions of South Australia” by R.J. French, W.E. Matheson and A.L. Clarke. Providing technical support for siting and construction of water storage dams (Steve Moore). This included construction of a large roaded catchment demonstration site for water harvesting and conservation on Nuriootpa Centre. A catchment management project was also established on the property of Colonel Dean near Moculta. Soil conservation programs with cereal growers aimed at enhancing soil organic matter levels and introduction of minimum tillage techniques. Ongoing contour banking in areas with a high risk of water erosion. This included contour planting of vineyards through the 1960’s and 1970’s. Evaluation of gypsum to improve soil structure. Support for the National Landcare and National Soil Conservation Programs. This included facilitating the formation of farmer Landcare groups and assisting with the education programs being delivered by this national program. Specialist Landcare programs were also run for grape growers (mainly by Tony Thompson) between 1989 and 1993, with support from horticulture technical staff. Providing technical support and administrative backup for the local soil conservation boards. (Yorke Peninsula, Hummocks, Lower North and Murray Plains Soil Conservation Boards). These Boards were active in promoting minimum tillage, fertiliser practices and erosion control techniques, and delivering soil conservation schools covering a wide array of topics. Expanding staff numbers initiated the construction of a new office, laboratory, library and conference complex at Nuriootpa Viticulture Experiment Station in 1979. This new complex incorporated the smaller cream brick office and laboratory facilities opened in 1965. The larger complex was officially opened by The Hon Ted Chapman on 11th May 1982. With the combination of research, extension and administrative functions, the complex then became known as the Nuriootpa Research and Advisory Centre. Since 1982, this team has been expanded and upgraded, and continues to provide services to dryland farming industries across the Lower North of the state. With subsequent structural changes the centre is now known as Nuriootpa Research Centre and delivers functions from PIRSA, SARDI (a Division of PIRSA), Rural Solutions SA. The Nuriootpa Research Centre office, laboratory, conference and library complex opened in 1982. During recent years, there has been a strengthening of the viticulture research program at the Nuriootpa Research Centre. CSIRO has closed its major horticultural and viticultural research centre at Merbein and relocated research staff to the Waite precinct. There is limited land at the Waite precinct to conduct viticulture field trials. As a result, the range of viticulture projects based at the Nuriootpa Research Centre has been expanded. The development of the Wine Innovation Cluster based at the Waite Institute, and made up of SARDI (a Division of PIRSA), CSIRO, University of Adelaide and the Australian Wine Research Institute, has increased research collaboration. The Wine Innovation Cluster has assembled approximately 70% of Australia’s expertise in viticulture and wine making science. It is expanding the use of Nuriootpa Research Centre as the main viticulture field research site in south eastern Australia. This article was prepared in 2014 by Barry Philp with information, contributions and assistance from Reg Radford, Michael McCarthy, David Woodard, and Bill Matheson. Soils and Agriculture of the Northern and Yorke Peninsula Regions of South Australia by R.J. French, W.E. Matheson and A.L. Clarke. New Complex for Research Centre; (PDF 2.6 MB) The Barossa and Light Herald, Thur 21st February 1980. A comprehensive article about proposed new facilities to be built at the Nuriootpa Viticulture Centre. New “Home” for Department of Agriculture (PDF 3.7 MB); The Barossa and Light Herald, Wed 20th January 1982. $1/2 Million Extensions to Barossa Viticulture Research Centre, at Nuriootpa (PDF 2.4 MB); The Leader; Wed 20th January, 1982. The Barossa Valley – prepared by officers of the Dept of Agriculture, Nuriootpa 1975 (PDF 1.5 MB).